Time to Invest in a Diopter for these Little Fish! 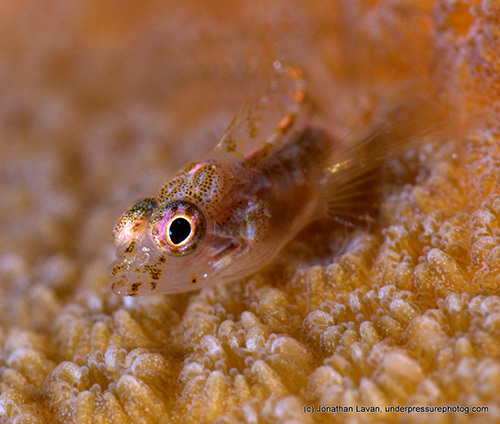 This month we will look at one of the smallest denizens of the Caribbean Coral Reef, the Southern Smoothhead Glass Blenny (Emblemariopsis bottomei). 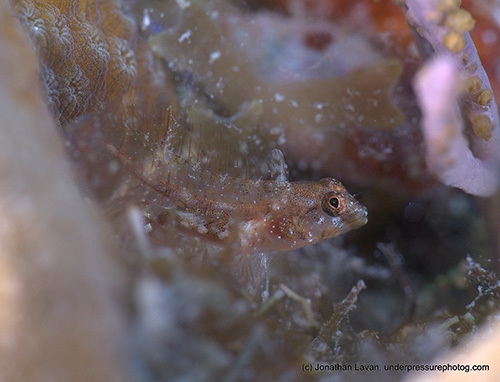 They are part of the recently re-identified and delineated Glass Blenny Complex that also includes various Glass Blennies over a broad geographical range of the Caribbean. 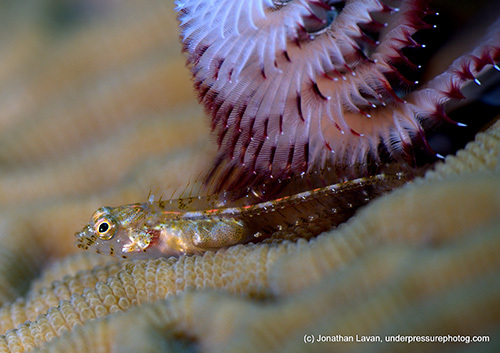 These blennies are virtually impossible to distinguish visually from each other in the field. The most frequently seen is the Southern Smoothhead Glass Blenny, which we will be looking at today. A great technique for photographing Glass Blennies is to use a shallow depth of field, resulting in a pleasing bokeh. They are called “Smoothhead“ as they are one of the few blennies to not have cirri above their eyes. Cirri are typically branched antennae-like structures that blennies are thought to use to sense water current direction. Since cirri are pretty much the fundamental feature of blennies, this can make these tiny fish (1/2 in. to 1 ¼ in. maximum) even more difficult to identify. They do have two small clear single cirri on their noses, but since the fish are so tiny these are very hard to see. To add insult to injury, they are called “Glass” as they are virtually see-thru - but not in all cases. 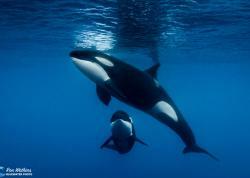 When the male is in its breeding phase its head turns dark (see photo). In fact, until recently the common name of this fish was the Darkhead Blenny, which you will still find in many fish identification books. This is misleading in that only the male fish has a dark head and then only when it is breeding. If you dive slowly and look carefully on the tops of live coral heads you will often see a tiny see-thru fish wiggling around between the polyps of the live coral. Trying to then figure out whether the fish was a female Darkhead Blenny was confusing at best. The renaming of the fish to the Smoothhead Glass Blenny will make an easier time for everyone interested in fish identification. The breeding male fish is usually found not out and exposed, but in an old worm hole (like many blennies in the Emblemariopsis and Emblemaria genus) looking to attract females to lay their eggs. I have found these fish, both female and male, to be quite plentiful in Key West Florida, Bonaire and particularly the islands of Roatan and Utila, Honduras. 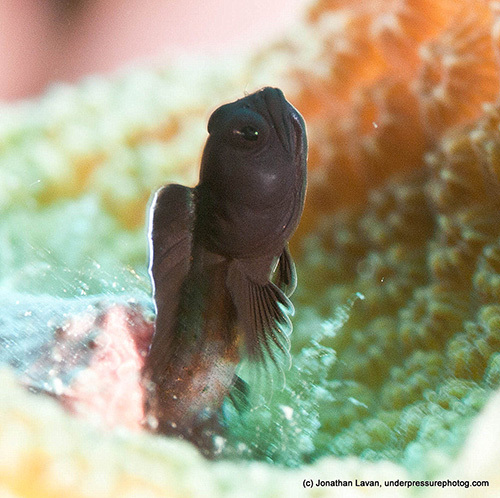 This male blenny has a black head - a sign that he is in his breeding phase. Capturing good shots of these fish takes a couple different tactics. The truly tiny see-thru females who are almost always out and in plenty of light tend to be a bit skittish, so approach slowly. I suggest a 105mm lens with a diopter of 5+ or 10+ so you can keep a bit more distance between you and your subject. A 60mm lens with a 10+ diopter will work also as long as your subject is cooperative. The dark headed breeding males are more difficult for a couple reasons. One, usually only their head is apparent, and two, it is very hard to capture detail on that very dark head and upper body. Adjustments of your f-stop and aperture may be necessary. 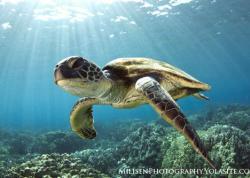 Make sure to hunker down, using expert buoyancy, to get as parallel to the fish as possible. These cool little fish are worth searching for, observing, and snapping a few shots of on a Caribbean Coral Reef. This Smoothhead Glass Blenny blends in well with the reef.